A US V-22 Osprey takes off from the USS Wasp suring amphibious landing exercises as part of the annual joint US-Philippines military exercise. A US warship laden with hi-tech fighter planes took centre stage at key war games in the Philippines Thursday, brandishing military might as fresh tensions bubble in the contentious South China Sea. 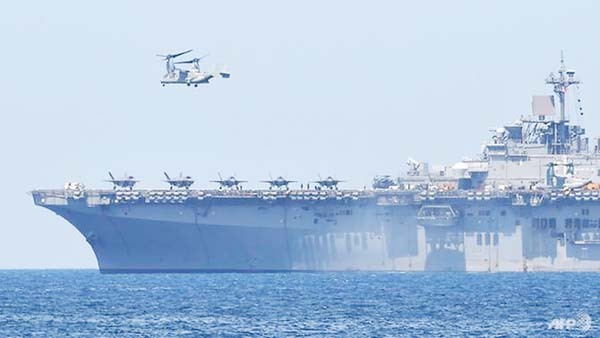 "We can't disclose the official movements of the USS Wasp for security reasons, but they have been operating in the South China Sea region… as part of the exercise," US spokeswoman Second Lieutenant Tori Sharpe told reporters. President Rodrigo Duterte had largely set aside the once-tense dispute over China's expansive claims to the resource-rich waterway, but told Beijing last week to back off over the "swarming" Chinese boats. The Philippines called the boats' presence "illegal" and Duterte threatened China with possible military action if it touches the island. China claims most of the sea, including waters and islands close to the shores of its neighbours. It has built artificial islands and military installations that the US warned could curtail right of passage by non-Chinese vessels. The Philippines, Brunei, Malaysia, Taiwan and Vietnam have also all staked claims to various islands and reefs in the sea that is thought to have rich petroleum reserves deep beneath its waters. The Wasp's participation in the exercises represents "an increase in military capability committed to a free and open Indo-Pacific region," the US navy said in a press release on its arrival last week. US Secretary of State Mike Pompeo pledged in March to come to the Philippines' defence in case of an "armed attack" in the sea, a clear assurance Philippines leaders had long sought. China has been reserved in its comments regarding Manila's recent uptick in assertiveness over the Pag-asa island, saying that it was working with the Philippines and looking into the reports regarding Chinese ships.